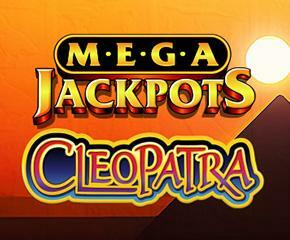 Mega Jackpots Cleopatra is the slot from the Mega Jackpots series designed and developed by IGT. This is a legendary Egyptian theme-based slot. This is a 5 reel, 3 rows and 20 paylines video slot with Progressive Jackpot. We have seen and played various slots based on Greek and Romans gods but Mega Jackpots Cleopatra is inspired by a lady who actually existed. She is Cleopatra who lived between 30 BC and 69 BC. She was the last Pharaoh of Ancient Egypt and also the partner of Mark Antony (a Roman politician).You would be taken to the world where kings and Queens ruled the Egypt. The background of the slot is gold in colour. Before you are introduced to Ancient Egypt, you have to place your bets ranging from 1 to 500 coins per line. Go for “Max Bet” to place a maximum wager of 10000 from your side. Spin yourself or let the slot setting do it for you by hitting the “Autoplay Button”. You can earn a maximum payout of 10000x. 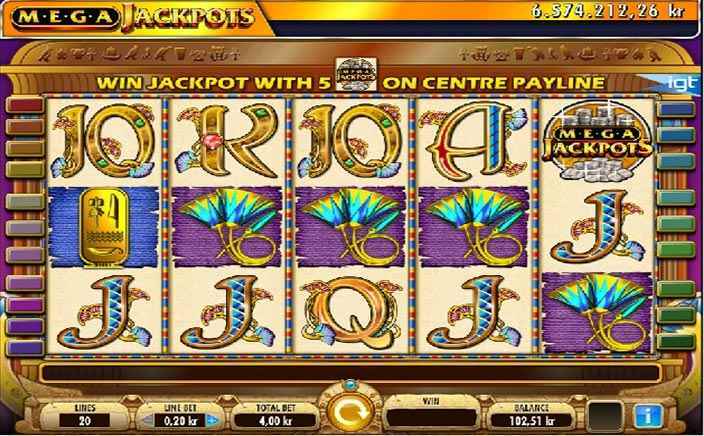 All the high-value symbols in the slot game are connected with the religion of Ancient Egypt which includes the Eye Of Horus and a scarab beetle. Moreover, the low-value symbols include literals, 9, 10, J, Q, K, and A, and each one is gold plated. The Cleopatra is the most valuable symbol. The other special symbols in Mega Jackpots Cleopatra slots includes the wild symbol which is the Cleopatra herself and the scatter symbol which is a pharaoh mask. Wild substitutes all other symbols except for the special symbols and double up the payouts when appearing in winning combinations.Free Spins: When three or more scatter symbols appear anywhere on the reels the free spins will be awarded to you and all the winnings during this round will be tripled. Landing another three scatters during the free spin round will award you another 15 free spins.Progressive jackpot: When the five Mega Jackpot symbollands on the centre reel in the base game or during a free spin round, then you will be awarded a progressive jackpot. Increase your chances by increasing the bet amount.Second Chance Jackpot: This happens behind the scenes as it is a random chance to win prizes. Mega Jackpots Cleopatra slots is well designed with free spins occurring regularly during the game. The soundtrack is a little odd but it can be easily muted. If you want to win huge, it is recommended to place higher bets as you can attain an RTP of 93%. So get ready to gamble high and earn huge.